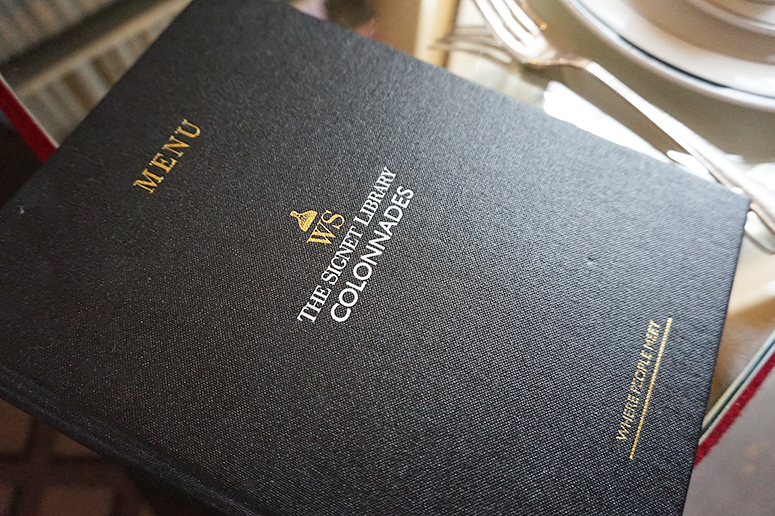 Set just behind Parliament Square near Edinburgh's famous Royal Mile, the Colonnades restaurant is quite literally located within a library. 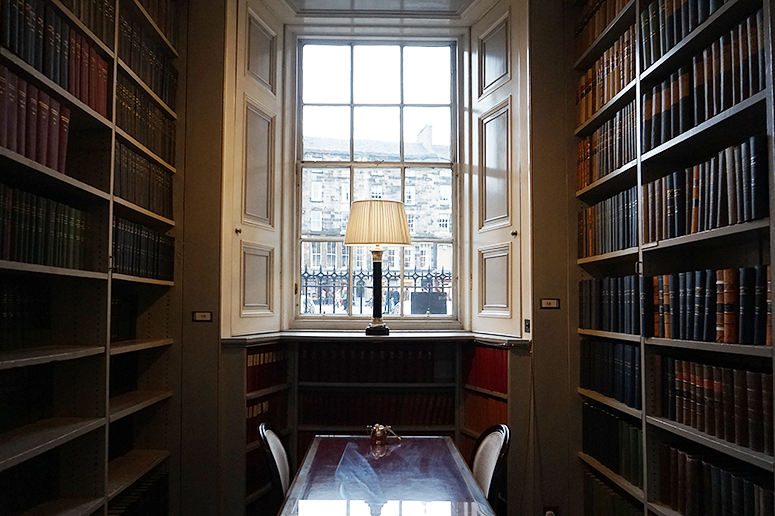 Being surrounded by ceiling high book cases filled with beautifully bound reads was a dream, and the way the tables were laid out everyone had their own little private nook with a beautiful view over Edinburgh Old Town to boot. 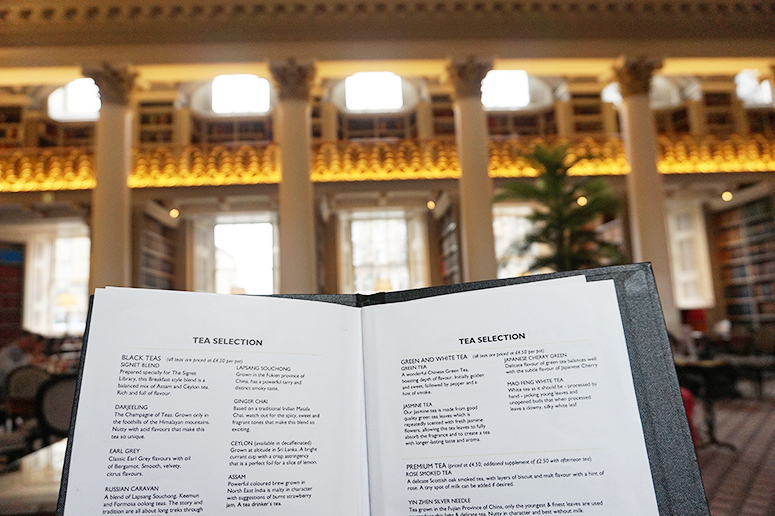 One of the most enjoyable parts of an afternoon tea I always find selected my tea(s) for the afternoon. I'm a big lover of tea and while you can't go wrong with an Earl Grey, Rooibos or Chai in my book, I love trying new flavours or returning to an old favourite in a new location as it'll likely be just a tad different. There are some really interested 'premium' teas on offer at Colonnades (such as Rose Smoked Tea and Yin Zhen Silver Needle) but they're unfortunately not included in the afternoon tea price so I opted for an Assam on this occasion, another favourite of mine. 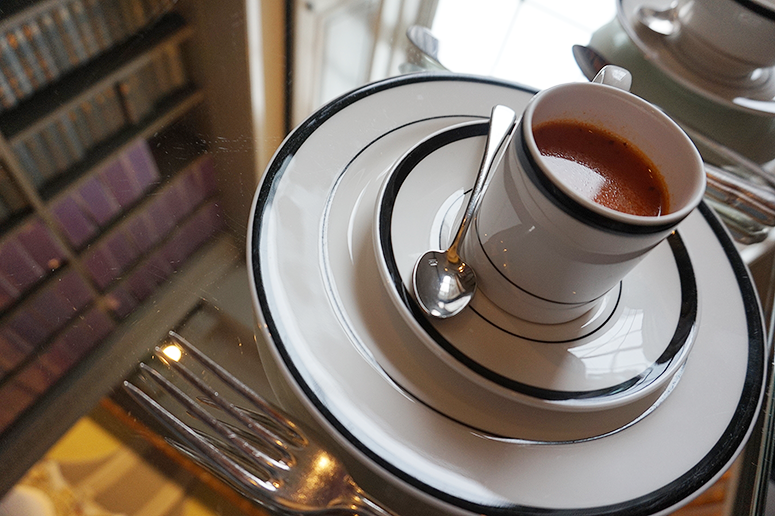 Preceding our tea arrival was an ambuse bouche in the shape of a small tomato soup; my least favourite of the soup flavours normally but actually its small size made this an enjoyable treat to warm up and set the tone for the rest of the afternoon. And then the main event arrived on our table and we were well impressed. 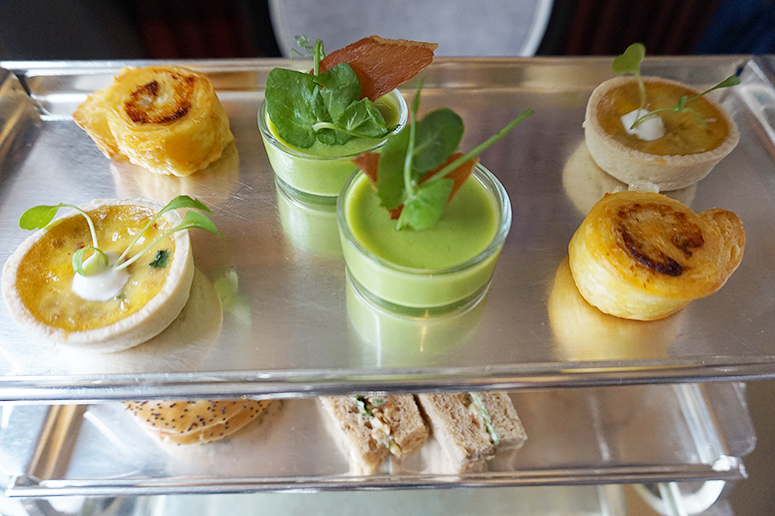 Rather than a traditional tiered stand encompassing a layer of sandwiches, a layer of scones and a final one of sweet treats, this was only the first course of our afternoon feast and it contained three full layers of savoury delights for us to enjoy. 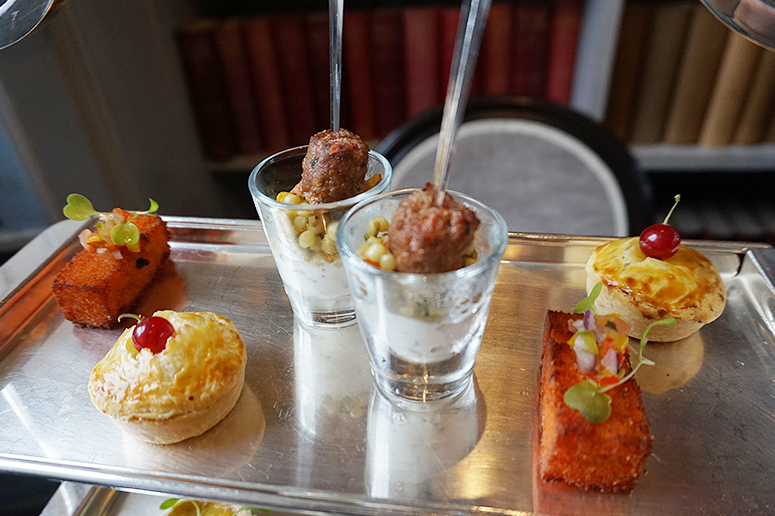 From top to bottom the treats were: Chicken, Leek & Tarragon Pie; Lamb Kofta, Couscous & Tzatziki; Red Pepper Polenta; Crab & Sweetcorn Quiche; Pea & Truffle Panna Cotta; Smoked Applewood & Pesto Rossi Pinwheel; Smoked Salmon & Cream Cheese Bagel; and Mull of Kintyre Cheddar & Onion Marmalade . There was so much choice and I started out taking a small bite of each thing as I wanted to savour the one I liked best for last but I ended up absolutely loving almost everything (I only found the polenta and panna cotta slightly less flavoursome) so I ended up devouring it all... rather quickly. 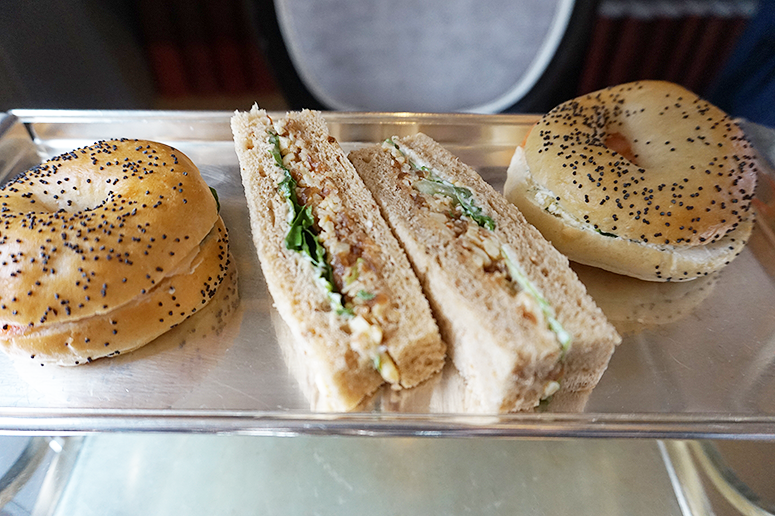 It would be hard to pick a single favourite of this bunch but my top three would include (in no particular order): the lamb kofta, the bagel and the pinwheel. Yum. Having barely recovered from the gorgeous savoury canapes, it was time to get onto the sweets which all looked absolutely stunning. This display contained from top to bottom: Peach Macaron; Mango & Coconut Panna Cotta; Strawberry & Basil Tart; Caramelia Eclair; Watermelon & Kiwi Melon; Millionaire Shot; Fruit & Plain Scones With Clotted Cream and Jam. The sweets looked truly extra-ordinary, but some of the flavour combinations were more experimental and I unfortunately wasn't a fan of the tart or jelly. 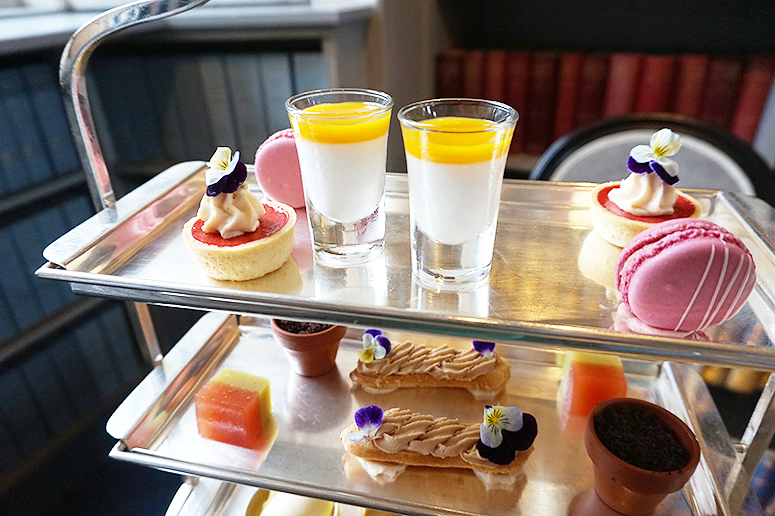 However, after the rather excessive savoury course where I finished everything I certainly wasn't starving and so trying just a bite of each of these two was fine for me and I did adore all of the other cakes and sweet delights on offer, particularly the macaron and panna cotta. 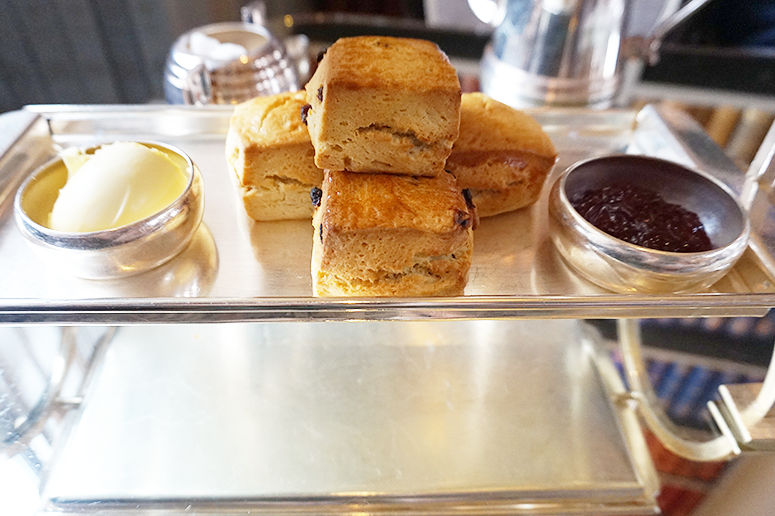 I am ashamed to admit that while we hugely enjoyed the scones (generously topped with first clotted cream and then jam – the only way to eat a scone, it's the perfect treat to have while sipping tea) we didn't even manage to finish them; the food offering at the afternoon tea was that generous. 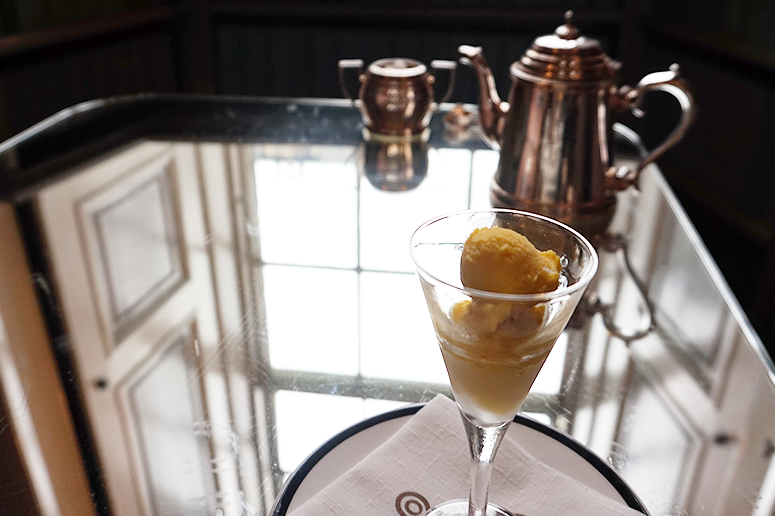 The afternoon tea finished with a refreshing mango sorbet, the perfect conclusion to cleanse the palate. 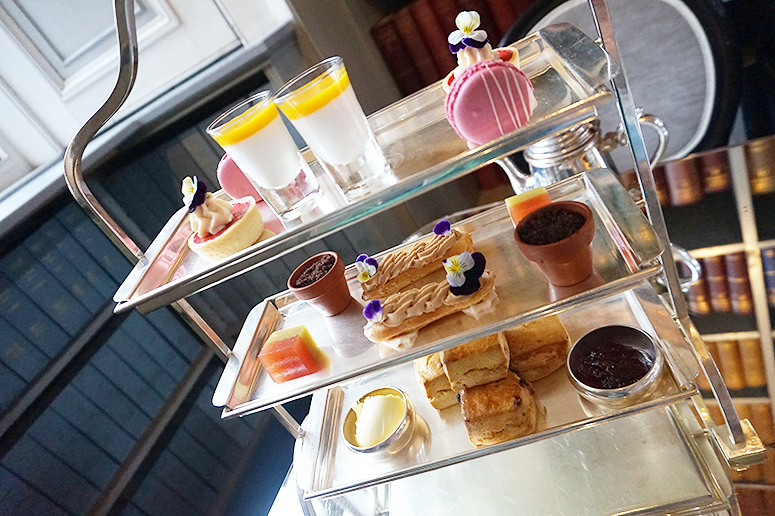 I have enjoyed many an afternoon tea in my day (just have a browse through my restaurant reviews to get a flavour of the places I've been to), but this was easily one of the best I've had the pleasure to experience. 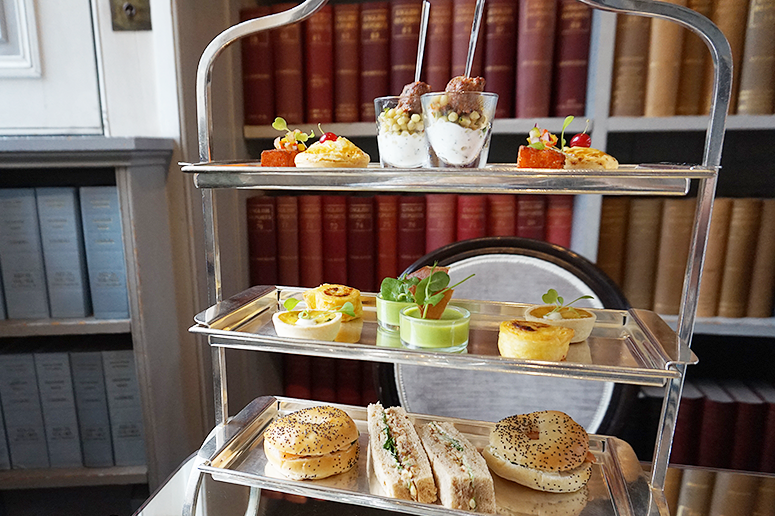 Not only because of its gorgeous library surroundings, which made us book in the first place, but also because of its generous and very unique foodie offerings. I'll definitely be returning on a next visit to Edinburgh! 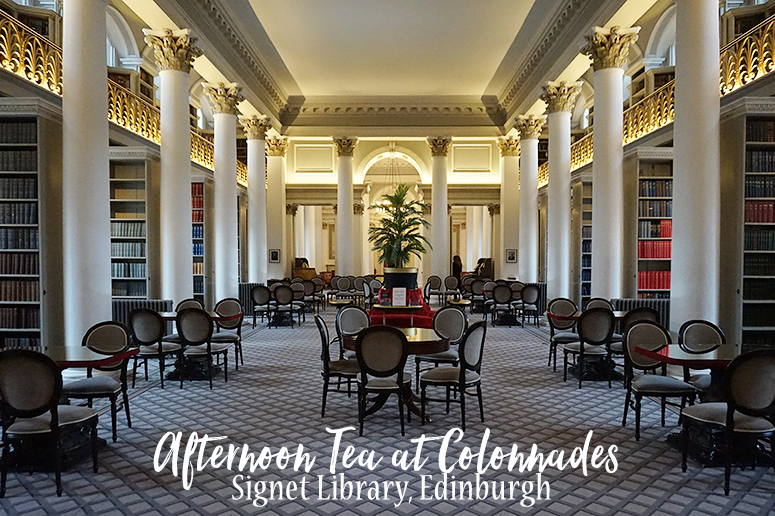 Colonnades at the Signet Library is located on Parliament Square, Edinburgh EH1 1RF, UK. 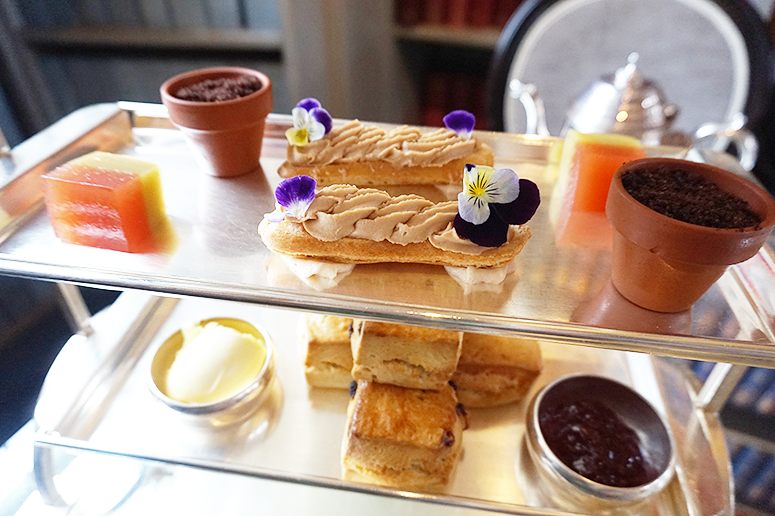 For more information on opening times and bookings (afternoon tea, lunch and drinks), check out the official page. This has def gone on my wishlist!